It took place slowly, over years. It was well-organized and had a very lofty goal in mind. It took schemes that made it look like they were your most trusted friend. In the end it worked. January 17, 1893 Queen Liliuokalani the last reigning monarch of Hawaii had been removed from her throne, the islands of Hawaii had been annexed to the United States and with much sorrow and grieving the Hawaiian flag had been lowered and the Stars and Stripes raised to take its place. To make sure that the future of Hawaii did not remain Hawaiian the language was banned in 1896. Now this was not to say it was banned at home or the streets but it was banned in the schools. Children were punished if they spoke their native language in class or were caught speaking it on the playground. Some say the parents refused to speak the Hawaiian language to the children because they wanted them to learn how to become a part of the new society that was taking over the islands. I can only speak from my experience with my parents. My parents spoke Spanish. In the 1950’s there was much prejudice against the Spanish and others in San Francisco where I lived. My parents fear of me experiencing any type of physical backlash for my ethnicity caused them to only speak Spanish to each other. I was not allowed to talk about anything that was not American, such as what we ate or celebrated. My mother wanted me to be American so that I would be safe. I believe this would have been true also of the Hawaiian families in the past. One of the drawbacks of doing this is a sense of shame. I felt this all through my younger years because of this ban my mother had put on me and many Hawaiians had felt this too. The Americans were successful in making their way of life to seem the superior. Through much work a group of Hawaiian people were successful in the 1970’s to get that ban taken off the books. Of course by then there were very few people who spoke the Hawaiian language. But by 1978 it was now made the official language of the state. 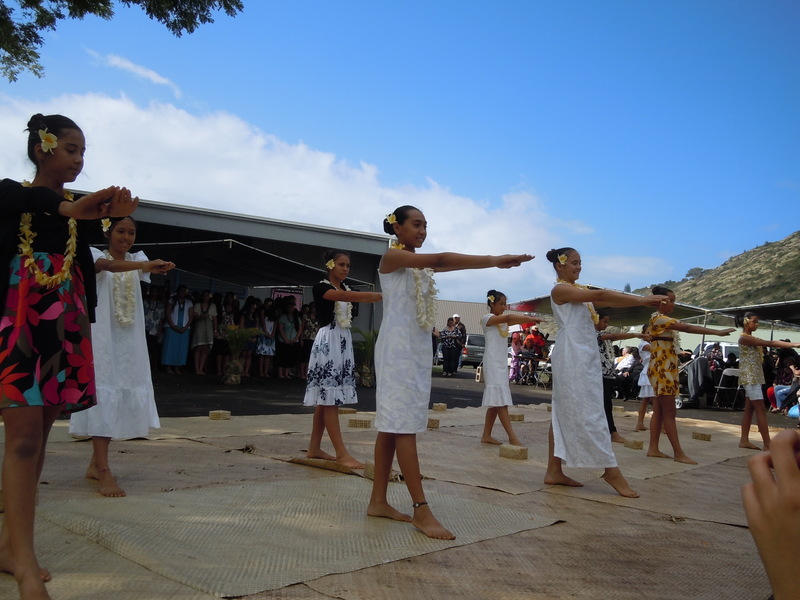 In 1995 Hawaiian Immersion schools started to spring up. Children started from preschool and now can go all the way into college speaking and learning the language and culture. 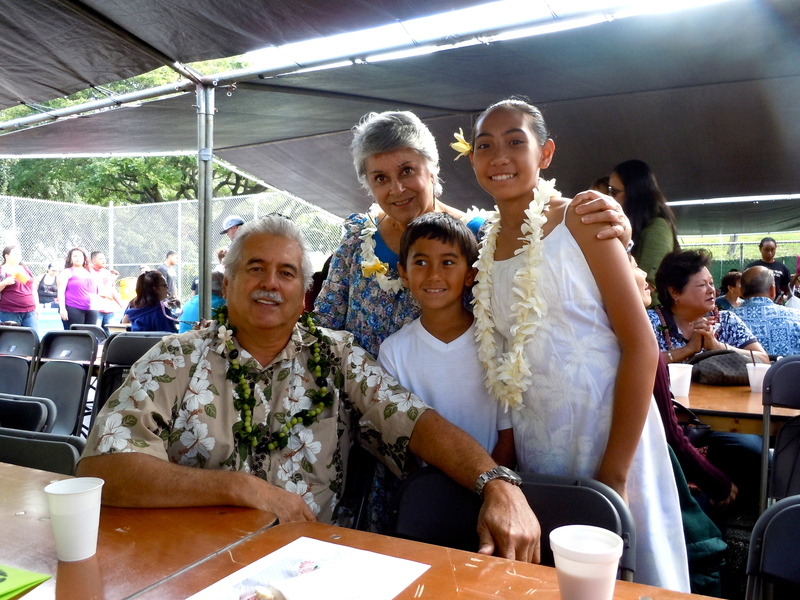 I’m very happy to say that two of my grandchildren are in a Hawaiian Immersion school and once a year I look forward to the opportunity to attend what is called “La Kupuna Day” where all of the elders in the students families are honored. 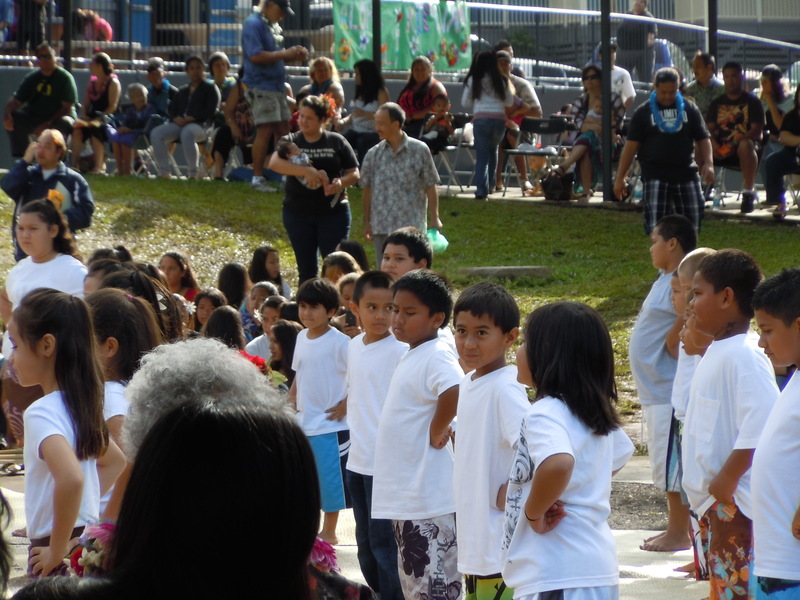 This is in keeping with the Hawaiian tradition that looks on the elders as very valuable educators. The Hawaiians did not look on their older people as doddering old fools or always giving unwanted advise. They looked to them as those who could draw from their years of experience and impart wise advise. Hence La Kupuna Day. And so the day begins. 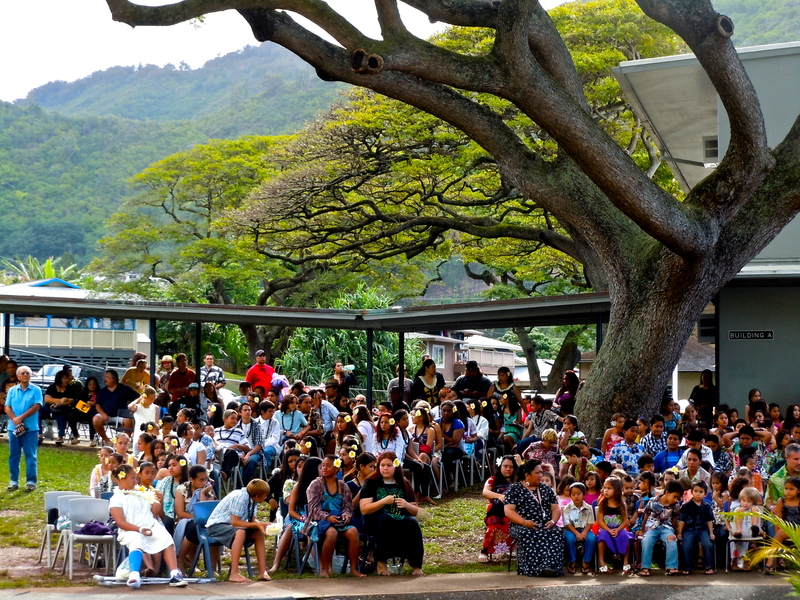 The students are all seated in their chairs outside waiting for their Kupuna to arrive. 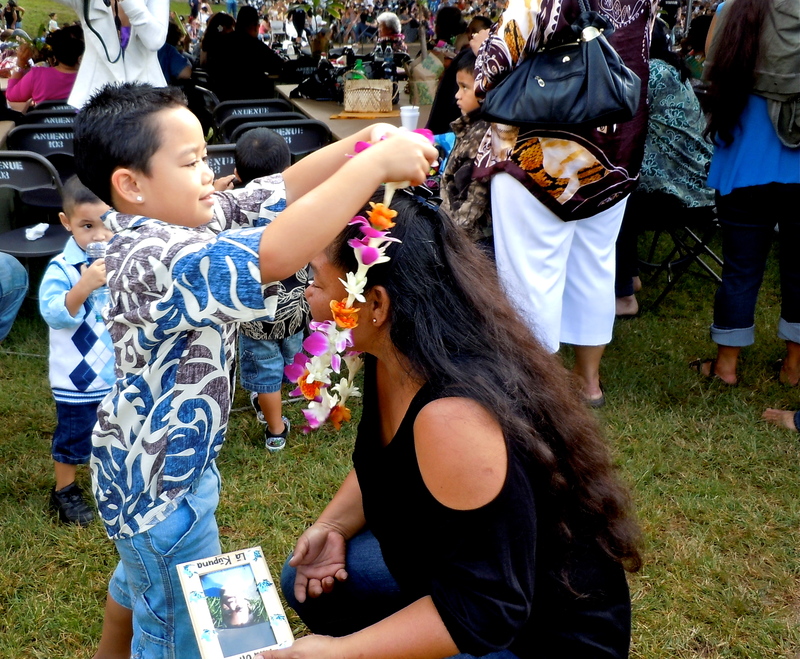 The program begins with the honoring of the family by giving them leis. 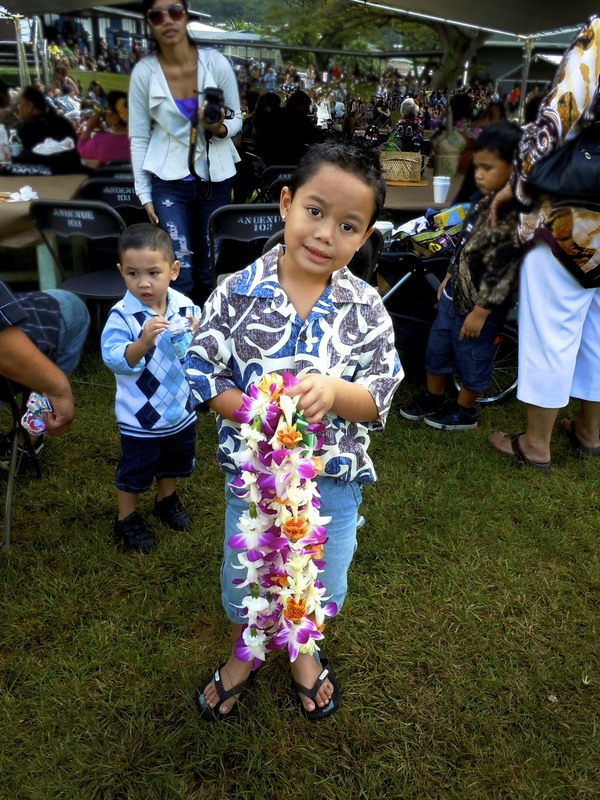 Each studentʻs Kupuna is named and the student then goes and gives us leis. 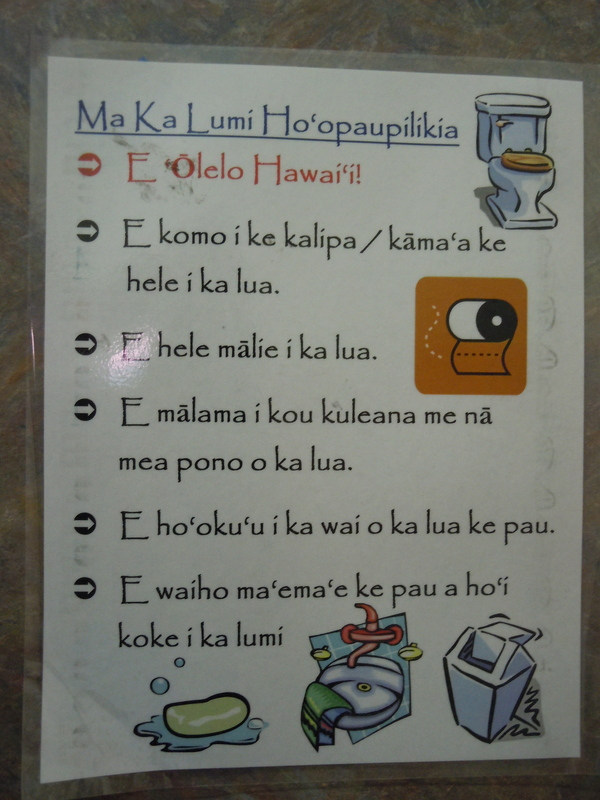 The Hawaiian language is everywhere throughout the school. This sign tells the children what is proper when using the bathroom. At the top of the list is to remember to speak Hawaiian. As well as the language the culture is being revived. This is called a Loʻi. 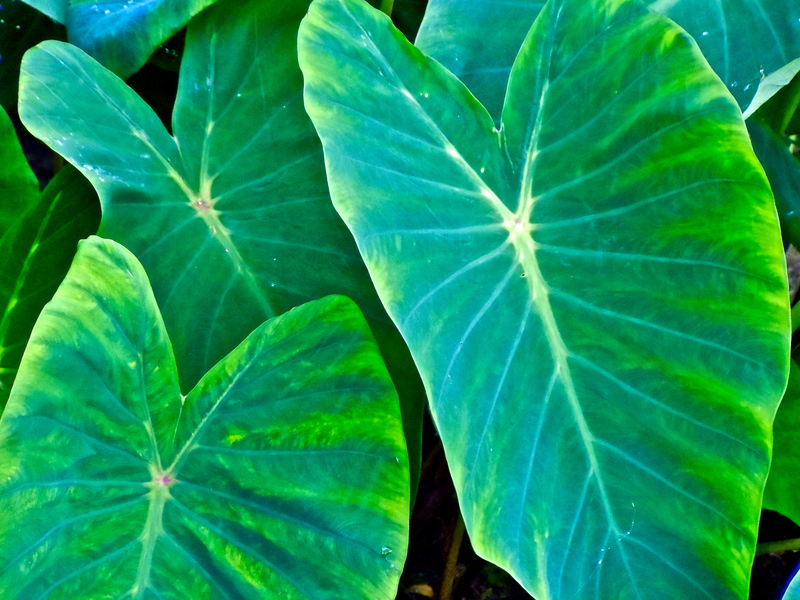 Taro, the main staple of the Hawaiian people is grown here by the children who then make poi from it. And let me tell you, tasting fresh made poi makes all the difference in the world. 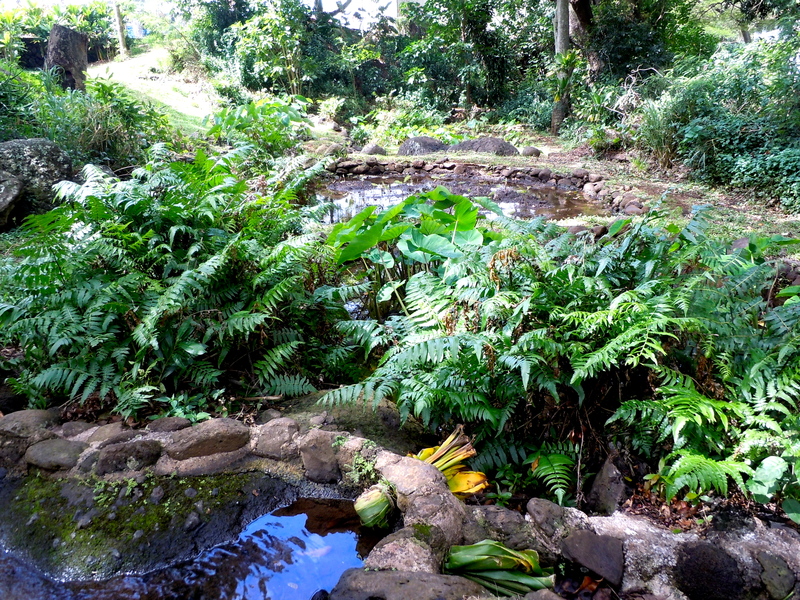 The taro plant was not just a root that the Hawaiians ate. It was their family. It gave them life. Indeed poi has just about every thing you need to maintain perfect health. The plant was also planted in groupings like a family. When planted in this way the leaves grow big and strong. When planted by itself they are smaller. It is such an honor to be a part of this “family” in this school. To be thought of so highly and honored this way. My only hope is that these children will be able to bring their culture back. Then and only then will the world know what the “Aloha Spirit” really is. May these schools thrive and prosper.